The promotion part is something that many companies tend to miss when looking at a content marketing strategy. A general rule of thumb is you should spend 30% of your time creating content and 70% promoting it. That’s why I created this checklist you can use to promote the content you work so hard to create. Before you get started creating, publishing and promoting content on your blog, you first need to have a blog. So, the first step in this checklist is to set up (or verify) your company blog! Record the link to the blog in the form field below. If you already have your blog set up, record the link and move on. If not, watch the below video to see how you can setup your company blog in under 5 minutes. The huge caveat to this checklist is that your content must be EPIC. If you create crap content, most of these techniques will yield little to no results and will be a huge waste of time. 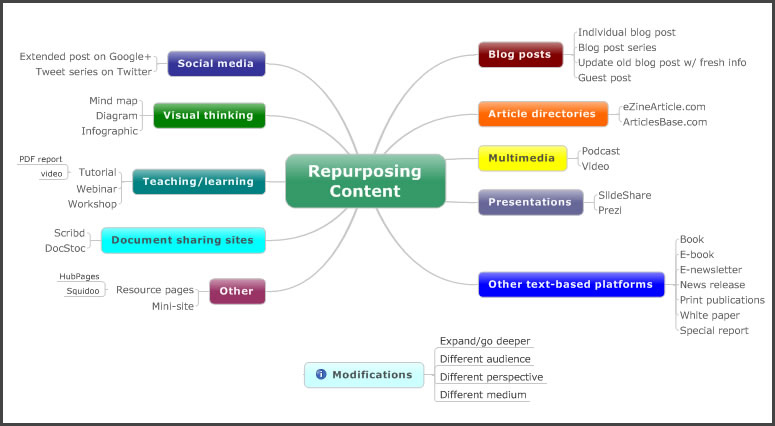 The next step is to prepare a summary of your content. Use the form fields below to record each section of the post summary for easy re-use across platforms. Don’t forget you can get this as an interactive checklist inside Process Street, allowing you to track the promotion of multiple pieces of content, customize and hand off to your team. Start a free 30 day trial of Process Street to see it in action. This one is fairly obvious; share the post across your social media channels. You can significantly speed up this process using a social media management tool. Record your progress with the sub-checklist below. Not sure how or what this social media thing is? Check out the below video for a great introduction into the basics of Social Media. Another pretty straightforward task now - you need to email your subscribers!. You should be collecting leads on your website and you should be promoting your content to those leads. For example, you can use Mailchimp set up on an auto RSS feed to automatically email new blog posts out. Most email service providers such Aweber and Getresponse have this option too. Here is one of the email templates we use for Mailchimp; you can use it and modify it if you are a Mailchimp user. 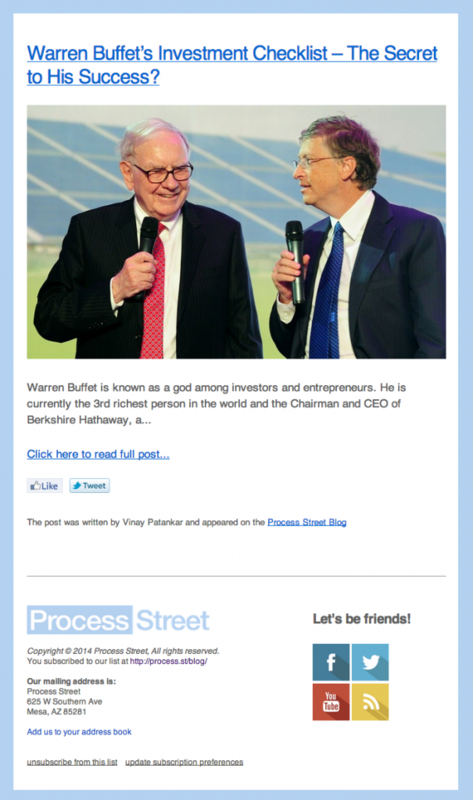 While we’re on the topic of email, subscribe to the Process Street blog to receive new posts from us via email! Outreach means manually emailing, tweeting and even calling people to tell them about your content. Yes, yes, this sounds like hard work and truthfully it is, but sometimes you have to do things that don’t scale to get the ball rolling. Use the form field below to record the list of bloggers which you will be targeting. Now you need to submit your content to social bookmarking sites and directories. Use the form field below to keep track of which sites you have submitted your content to. Next up in the content promotion checklist is submitting your content for syndication. Remember to record the sites you submit your content to with the form field below; that way you'll never lose track of where your content is already uploaded! Remember to use JustReTweet for some free promotion! Record the status of the post with the form field below. JustReTweet is a kind of Twitter exchange, where you can earn credit re-tweeting other peoples' posts and use that credit for others to retweet your posts. This is a great way to get some early re-tweets and social proof for your post. 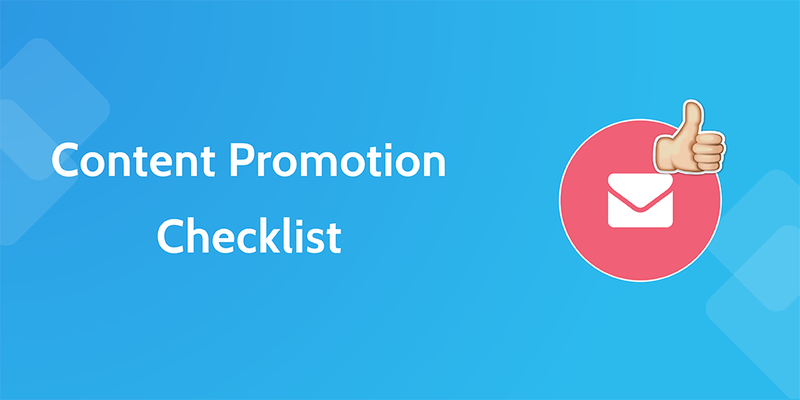 Next up in the content promotion checklist is to post on related forums and groups. As always, record the forums and groups you've submitted to with the trusty form fields below. 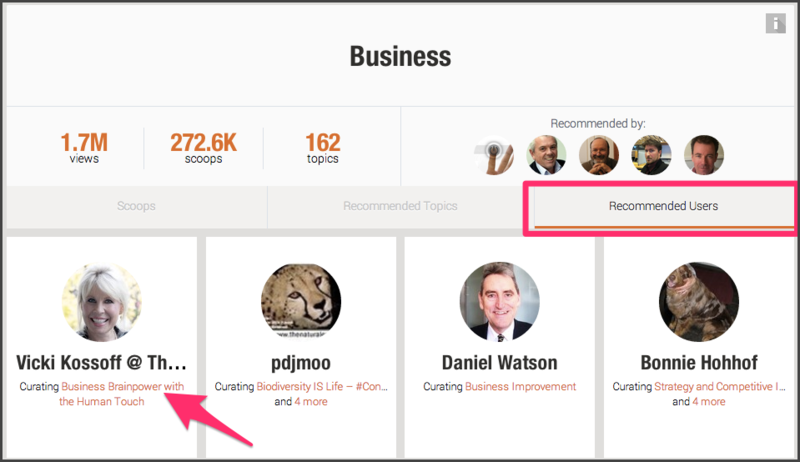 Now you should (at least consider) commenting on related blog posts. Record the URLs of any blog posts you comment on in the form field below. I don’t do this at the moment. Generally what I do is after I publish a post, I search 2-5 variations of my post title. For example, on my post “Why I Moved from Dropbox to Google Drive” I did a search for “Dropbox vs Google Drive”, “Google Drive Review” and “Dropbox Review”. I then searched just the first and second page of Google for articles that allowed comments, posted a quick response to the article and included my link. Don’t bother going past the second page of search results, as 90% of people don’t visit the second page of Google. Sometimes your comment won’t get approved, but if your content is EPIC and RELEVANT you should get approved no problems. If you don’t feel comfortable posting the URL to your post in the comment, most comment systems allow you to include a link to your website that will be attached to your user name. Here you can include a link to your content, although it will probably get a lower click through rate. 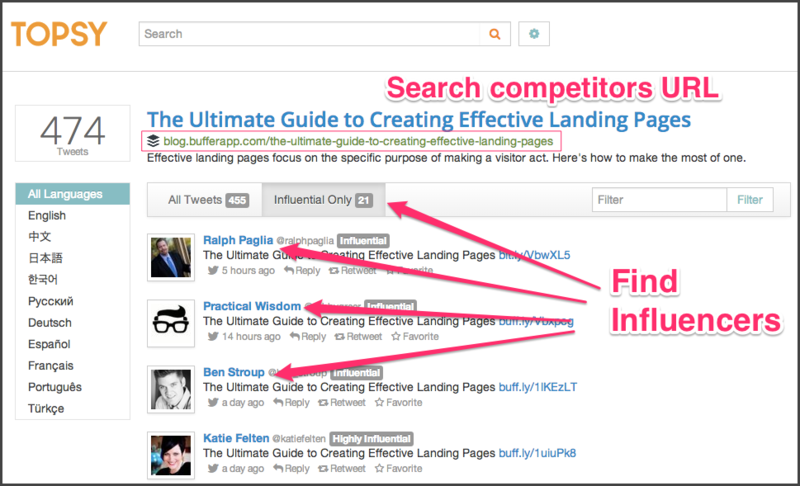 Search major Q&A sites for posts related to your content and post responses in the answers when appropriate. Record links to the questions you answer with the form field below. 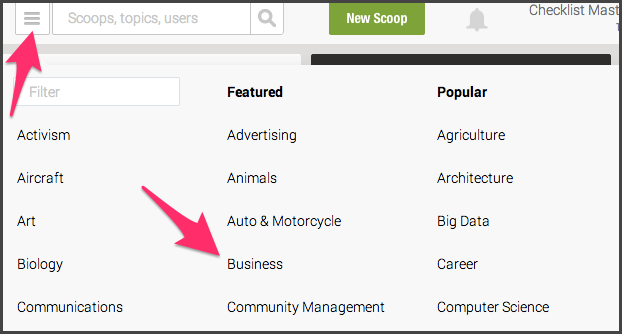 The next step in promoting your content is to assign your post to the relevant lists in Scoop.it. As always, use the form field below to record which lists you submit your content to. Part of the content promotion checklist is not only about boosting your post - it's about combating the competition for the top search spot. Now you need to reverse engineer your competition and record all relevant information using the form fields below. If you are aggressively working to build a blog and audience, you should consider paying to promote your content. Remember to not blindly shove money at the most available source; do you research, spend slowly and record all relevant info with the form fields below. As always, remember to record the posts you link inside with the form field below. Many blogs do a daily or weekly link round up where they post their favorite links from around the web. You should aim to be on as many of these as possible. This is something I am working on myself and working hard to systemize and make as streamlined as possible. I might do a guide on it in the future, but basically I want to be able to turn a blog post quickly into a video, then have my team edit it and distribute it across all the below sources. If you don’t want to record the video yourself, you can write up a script and have someone from Elance read it for you. Congratulations! You've completed the content promotion checklist and can now watch that view count fly. Celebrate with your team and get ready to start on the next post!